Do you love to camp or are you yearning to try it? Camping can be intimidating with young children, however, once you are there and begin to relax it's such a great time for all. This Saturday, June 26th is the National Wildlife Federations Great American Backyard Campout, celebrating lasting memories with your kids and connecting them to the outdoors. 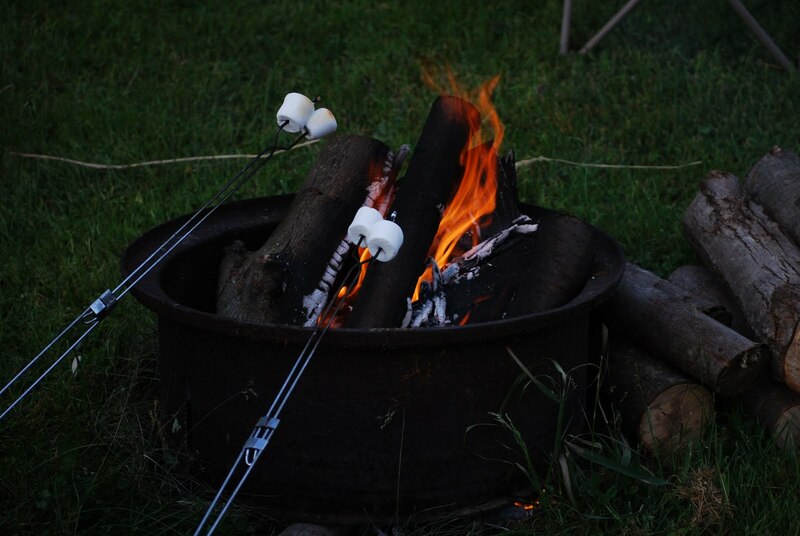 Camping creates such a connection to nature and the simple enjoyments of life that we often forget; sitting by a fire, enjoying a meal prepared and shared together, stargazing on a clear night and roasting marshmallows. Opportunities for outdoor adventures are endless; hiking, fishing, swimming, biking, and just exploring nature are right there waiting for you. We recently took a short trip to Orford, NH to The Pastures Campground for a weekend and it was awesome in every way. The Pastures is a great family campground offering large grassy campsites with plenty of room between you and your neighbors. Their amenities include a heated swimming pool, access to the Connecticut River with over 40 miles of navigable water for fishing and boating, pontoon, kayak and canoe rentals, large playground and sandbox, horseshoe pits, ping pong, and volleyball courts to name just a few. They also have pavillion space for large picnics and gatherings. The Pastures offers a peaceful and relaxing environment to kick back with a good book and plenty of activity if you desire. The Pastures is right on Route 10 in historic Orford on the Connecticut River. Take a short walk to the General Store in town for ice or if you've forgotten something. Drive or even walk across the river to Fairlee, VT for an ice cream treat at the Whippi Dip. Looking for other things to do or new areas to explore while you're there? The area offers a great deal of hiking trails, check out the Cross Rivendell Trail Guidebook & Maps, take in a movie at The Fairlee Drive-In, the White Mountains are just a short drive northeast and depending upon the season check out Windy Ridge Orchard in North Haverhill for blueberry, apple and pumpkin picking, they also offer plenty of kids activities with farm animals, a playground, nature trails and a cafe. Although we didn't drive very far from home to spend a weekend away camping, we felt like we were a million miles away. You don't have to drive very far to find a number of campgrounds in our area to get away from it all, check out our listings in our camping resource category. Pack up your tent, the basics, keeping it simple is key and head out for a good time and some true down time connecting to the world around you. Have a great weekend.